Studio open daily by appointment: (Metal Arts Village): 3230 N Dodge Blvd, Tucson, AZ, 85716. Betina Fink, MFA, is an oil painter originally from Delaware. Arizona has been her home since the 1980’s, including 7 years when she lived and worked in Amsterdam, Rotterdam and the Hague, Netherlands. While in Europe Betina studied classical painting and drawing. Her studies of egg tempera painting and the works of the masters helped to ground her studio practice soundly in the historical traditions of Rembrandt and Vermeer. The effects of northern light, time and place combined with the artist’s own impressions living as an American abroad helped to formulate a lasting aesthetic and reverence to “Painting” that she brings to her work today, while being inspired by landscapes of the American southwest and west coast. Her return to Arizona in the ’90s’ brought her to Rancho Linda Vista, an artists’ community in a historic dude ranch in the small town of Oracle, north of Tucson, where she lived and worked for 10 years. Some of her former professors lived on the ranch, and she joined what has been dubbed by Tucson arts writer Margaret Regan, as “the Tucson Landscape School.” It was while living at the ranch that Fink made the switch from painting more abstractly to creating more representational works. As a result, “her art is positioned in both worlds, and uses the bold expressive mark making and color of an abstractionist, with a more controlled description of the realist”. At the University of Arizona Fink studied with : Figurative painters Robert Colescott, (who studied with Fernand Leger) ; James G. Davis, and Bailey Doogan; landscape painter Bruce McGrew. At the University of Delaware she studied with representational painters Stephen Tanis and Larry Holmes. Fink’s large and small scale works have been exhibited and are in collections internationally. She founded Tucson Classical Atelier in 2014, where she teaches classical painting and drawing, at the Metal Arts Village, in Tucson. She was a founding teaching artist and administrator at The Drawing Studio, Tucson. Public collections include Tucson Museum of Art; Royal Dutch Embassy, Yugoslavia; Department of Foreign Affairs, The Hague. Affiliations include OPA (Oil Painters of America); TPAPS (Tucson Plein Air Painters Society) and PAPNM (Plein Air Painters of New Mexico). 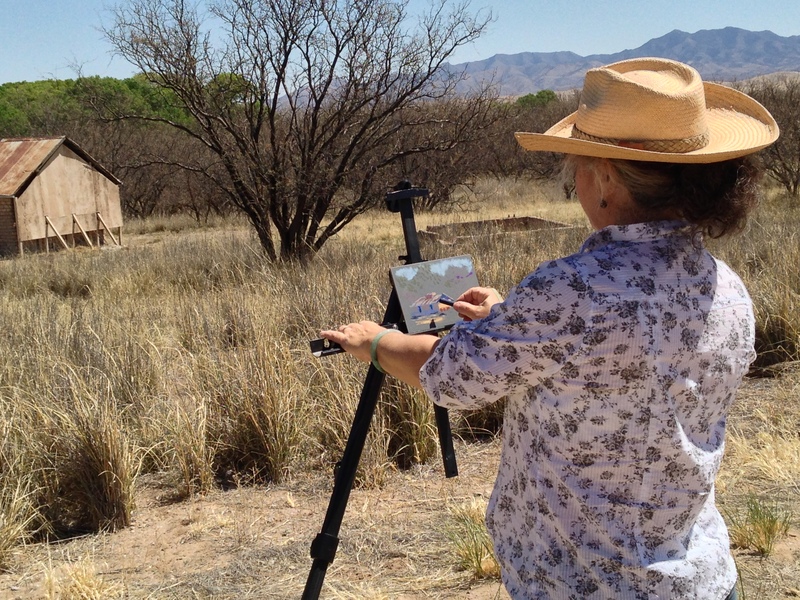 Drawing en plein air, the Historic Empire Ranch, Arizona. 1995 –2015: The Drawing Studio, Tucson, Arizona. Oil painting, pastel drawing and color theory. Founding teaching artist, manager and Youth Program Director. Program grants in conjunction with The Drawing Studio (2002-2014): National Endowment of the Arts; Arizona Commision on the Arts, Tucson Pima Arts Council, Kresge Foundation, Community Foundation of Southern Arizona, Target.